Tess Jaray has been an influential figure in the British art world since the 1960s. As both a Senior Royal Academician and an Honorary Fellow of the RIBA, her career spans more than fifty years, throughout which time she has produced a vast body of work. Jaray arrived with her family to the UK as an infant in 1938 as part of the flight of Jewish refugees from the Nazis. Aged sixteen she embarked on her journey as an artist and enrolled first at Saint Martin’s School of Art in London later at the Slade School of Fine Art (1957-1960), studying under the likes of William Coldstream, Bartos Dos Santos and Ernst Gombrich. Jaray has further been a great influence on younger British artists through her writing and the thirty years spent teaching at the Slade (1968-1999). 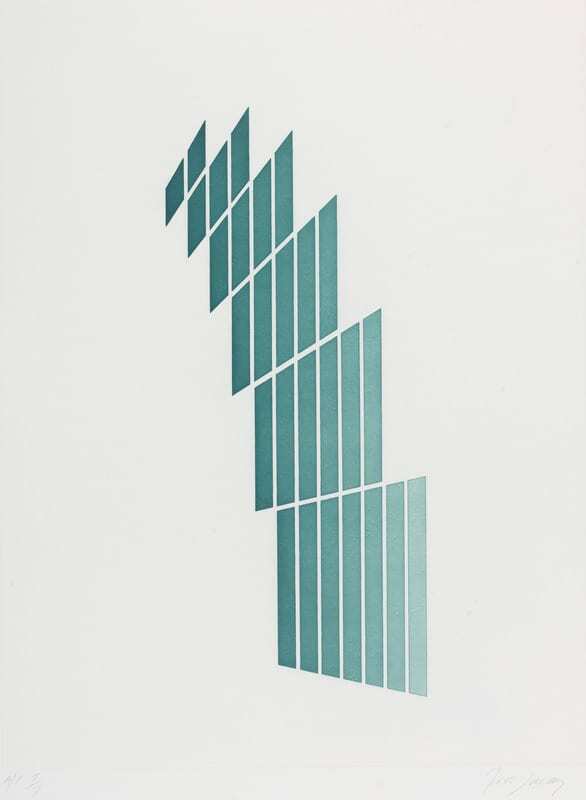 Jaray’s paintings and prints are geometric abstract works where an interaction of form and colour creates a sense of space within the composition and raises questions of perception, repetition and the limitations of abstraction. Framed and flattened compositions using minimal forms, the paintings are drawing inspiration from architecture and space. Working from perspective and architectural drawings, Jaray reduces her compositions down to the point of abstraction where the work creates an ambiguous space of perception. The aquatint Always Now is typical of the artist’s practice in the 1980s when she painted structures using a subdued palette and colour gradient on top of a cream-coloured background. Placing the compositions in the centre of the canvas with this restrained background, Jaray removes the boundaries between the viewer and the painting, making the viewer an active participant in the play between a ‘stable’ painting and a space-altering structure, required to engage intensely with the work. In the print, we also see these qualities, yet the scale of the work rather makes the structure appear to float on the surface with each rhomboid seemingly sliding away from the centre. What has drawn me in and interested me about Tess Jaray is her ability to render space within paintings and prints of minimal formal elements. From her monumental paintings that hold you in and create an illusion of depth to smaller prints and paintings, the work always puts the question of perception at the forefront. Intricate and meticulously executed. they also make you question their method of creation and wonder how it is possible to make such a work that threads the boundaries of various disciplines. Discovering and eventually researching Tess was a process that really began with my time at UCL Art Museum, which began with volunteering and progressed to freelance work throughout my graduate studies (MA History of Art) and beyond. My time with the museum has been integral to me in forming my academic interests. Working at the museum has truly been invaluable for my professional development, offering unparalleled access to an extraordinary collection of prints and drawings, whilst also learning crucial skills for work in the arts and heritage sector. I first came across Always Now by chance while matching images to the records in the museum’s database. I was immediately mesmerised and had to figure out who the artist behind this great work was. My interest finally led me years later to write my MA dissertation about Jaray under the supervision of Dr Briony Fer. This process gave me the chance to get to know the artist personally through multiple conversations, which gave invaluable insight into her decades-spanning career. My dissertation focused on the role of space and architecture in Jaray’s paintings and looked at her paintings from the 1960s, the 1980s and the newest body of work from 2017-18, which had at the time not yet been shown publicly. I was then given the chance to contribute an essay, published to accompany an exhibition of her new body of work currently on view at the Barber Institute of Fine Arts at the University of Birmingham. From Outside: Tess Jaray displays six paintings of Jaray from 2017-18, inspired by the façade and Art Deco design of the Barber building. With the paintings at the Barber, we can see many resemblances to the print in UCL Art Museum’s collections. The colour and gradience of the structures indicate the physicality of architecture whilst using minimal shapes to evoke a sense of space. The composition therefore implies movement and depth in the paintings but requires active visual engagement to reveal and experience the complexity and spatial possibilities of the work. Viktoria Espelund is a UCL alumna and independent art writer. From Outside: Tess Jaray is on view until 12 May 2019 at the Barber Institute of Fine Arts at the University of Birmingham. The exhibition booklet with the essay is available for purchase from the Barber shop and is also available to read, print and download for free from Barber’s website.